With Labor Day in the books, I figured it might be a good time to touch upon the subject of fresh starts. Let’s assume you took some time off from training and are now ready to jump back in. What to do? First, how long was your break? Two to three weeks? You are fine – just take it a bit easier the first week. Two or three months? That is a different story. Here is my laundry list. 1. Don’t beat yourself up. Life happens, you took some time off, the world and your physique will not collapse. 2. Consider changing gyms. There is probably a reason why you stopped going to your old gym. Maybe you didn’t like the energy, felt uncomfortable, but it’s time for new beginnings. 3.Clean out your pantry. Most likely, you adopted some unhealthy eating habits that manifest themselves in your shopping choices. 4.Most importantly, check your training readiness before actually starting. Here is how to see if you are ready to train. The wall slide test: stand leaning against a wall, while raising the hands above the head. If the shoulders come off or cannot stay close to the wall, your shoulder flexibility is impaired and an injury is on its way. If either one occurs, you have weak glutes and a tight (and most likely weak) lower back. 5. Don’t be a hero. No, you cannot do the same workout you did back in college or even six months ago. Start by training the whole body three times a week. 6. Diet. Dont do too much at once. Very often people start too aggressively after a lay off, cutting calories and doing hour-long workouts, just to burn out and quit within weeks. At first, just get rid of the biggest disasters (alcohol, fried foods) and work your way up to a proper diet from there. 7. NO supplements. This is your chance to a fresh start, do it right. Supplements are largely a waste of money and do not replace training and diet. 8. There will be soreness. 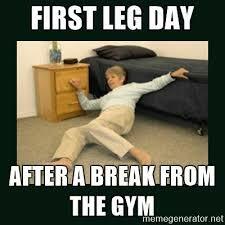 The first week of training is always the hardest, just get it over with! Glad to have you back in the gym! Previous post: Lets talk about feelings! Next post: Circuits- Greatest Training Tool Ever?